Route 81 of the National Cycle Network runs between Wolverhampton and Aberystwyth. I was touring in Mid Wales when I happened upon a Route 81 sign in Welshpool. Since I had no precise plan of where to go next, I decided to follow the route and see where it would take me. It turned out I wouldn’t regret it. 0 miles From Welshpool rail station, the route briefly follows the Montgomery Canal in a southerly direction. In the absence of a towpath, there is a short section on the A458 ending in a slightly tricky right turn towards Powis Castle. Leaving the canal behind, it’s immediately uphill; a taste of what’s to come. 1 mile Throughout the 15 miles between Welshpool and Newtown the route is impeccably signposted, following quiet roads that dip in and out of the valleys of various Severn tributaries, before eventually joining the river itself. 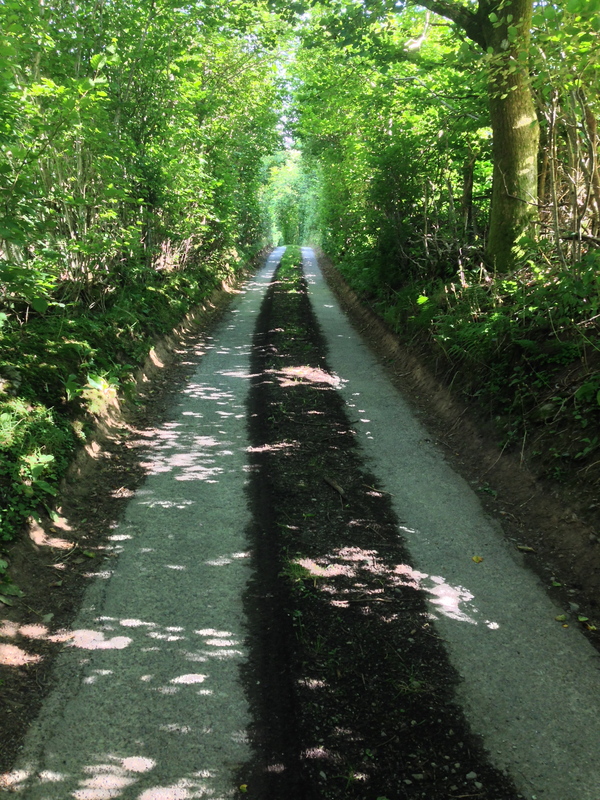 The traverse of Newtown is virtually car-free with the route leaving the B4389 just after Aberbechan to follow towpaths and footpaths for several miles, staying close to the river Severn. Needless to say that this section is slow, as paths are shared with pedestrians most of the way through Newtown. 17 miles As the route exits the riverside park, there is scope for confusion as the signposting here isn’t watertight. I ended up missing a left turn, off the A489, and turned to Google Maps when I got to a big roundabout with no familiar signs. Leaving Newtown beh ind, the route continues on narrow, quiet roads, climbing out of the Severn valley to the oddly named hamlet of Stepaside. From here, the scenic quality is a step up, as is the effort required to cycle up a long and rather steep hill. In the absence of Route 81 signs, I occasionally wondered if I was still on course, which was only confirmed two miles and seven side roads later. The long climb is followed by an exhilarating descent that features an actual hairpin bend. Caution required throughout, as one cannot see very far ahead on this narrow road. 24 miles At Caersws the route briefly checks in with the populated world – an A-road, a shop and a pub, a railway station – before heading off into tranquil countryside again. The narrow road leads over a series of short, steep hills before re-joining the Severn river in the pretty town of Llanidloes. It’s easy to miss some of the signs here – cyclists should make a sharp right turn in the town centre and aim for the old bridge over the Severn, not continue straight on as I did. 34 miles After crossing the Severn one final time, the road goes up and up again to the highest point so far, then down abruptly into the village of Llangurig. 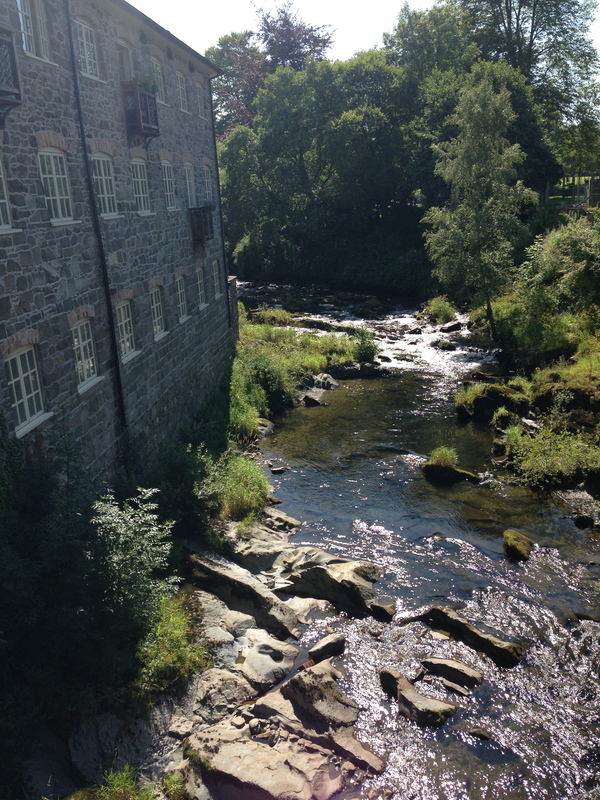 Here, it crosses the busy A44 to then team up with the River Wye, which it accompanies for ten very scenic miles. The road does not stay level with the river, but gently rises and falls, offering fantastic views over the deep valley. A few miles into this road, it seems to end in a private farmyard, with a gate blocking the way and no Route 81 signage to help out. Luckily for me, there was a lady at the first farm who clarified that the cycle route passes through their property, and that cyclists are welcome to operate the gates to continue their way. 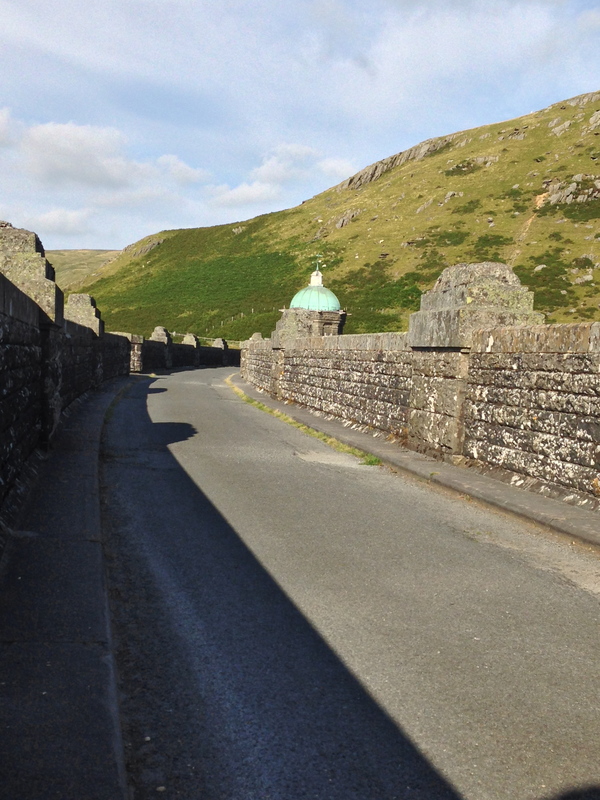 There are another four or five gates over the next few miles, then the route brushes the town of Rhayader, before dramatically changing character. 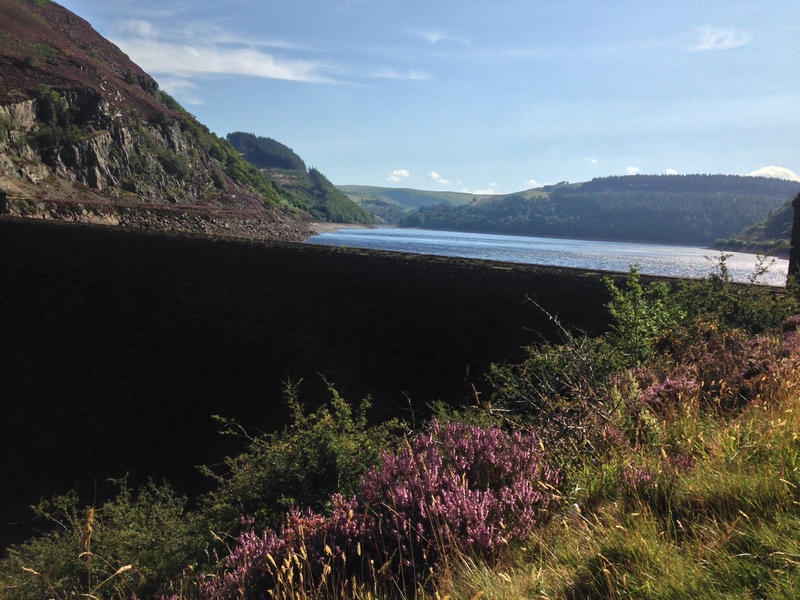 45 miles From Rhayader, the route coincides with the Elan Valley Trail for about nine miles, and for much of that distance it runs on the disused Elan Valley Railway track. The track is shar ed with pedestrians rather than cars and the surface varies: some sections are unpaved. The change of landscape past Elan Village is sudden: the track now finds itself between a steep rock face and a deep valley, while it continues to climb at a gentle rate. Soon enough, the first of the victorian dams appears and the valley abruptly turns into a lake – the Caban-coch Reservoir. Two more dams and two more reservoirs lie ahead and the track continues to climb ever so slightly, lined with wildflowers for some of the way. 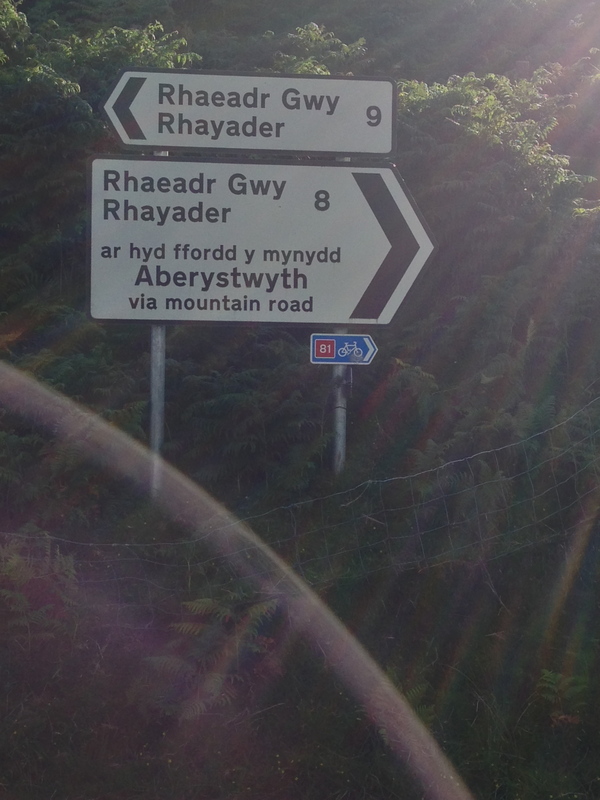 55 miles At the third and final dam, Route 81 becomes a tarmac road again, going across the dam, then northbound, a sign indicating ‘Aberystwyth – via mountain road’. It has climbed its way out of the Elan Valley and now a broad panorama of bare green hills opens itself. There is a very steep descent followed by a short steep climb where the road crosses the river Elan again – only a modest mountain stream here. Then, the route enters what must be one of Wales’ emptiest valleys. 60 miles Over the next six miles, there are perhaps three dwellings that can be seen from the road – otherwise there are just hills and sheep, with the rugged stream giving the shallow valley a Nordic feel. The persistent absence of Route 81 signs further exacerbates the feeling that I have come to the end of the world. But only temporarily, as I find out when rounding the pass between the Elan Valley and the Ystwyth Valley, which tops at 406 metres, the highest point on the route. 64 miles It is a long and beautiful descent into the valley of the River Ystwyth, a much deeper and narrower valley than the one I have just left behind. The road stays level with the river for a couple of miles, then climbs again. At a fork in the road, shortly after Cwmystwyth, the route departs from the main road and descends into woodland, using a gravel track. Signage is lacking in much of the wood section, although the various paths seem to all eventually lead to the same road, which if taken in the right (westerly) direction becomes Route 81 again. 73 miles Pont-rhyd-y-groes is the first village with amenities since Rhayader 25 miles ago. Exiting the village, the route continues to follow the River Ystwysth, crossing some dense forest with hillsides covered in ferns and tiny streams channeling the day’s rain towards the river below. This must be close to what a non-tropical rainforest looks like. After about three miles, the route very briefly joins the B4340. While the B-road departs from the ri ver and disappears uphill, the route takes a right turn onto a path that ends at a stream. 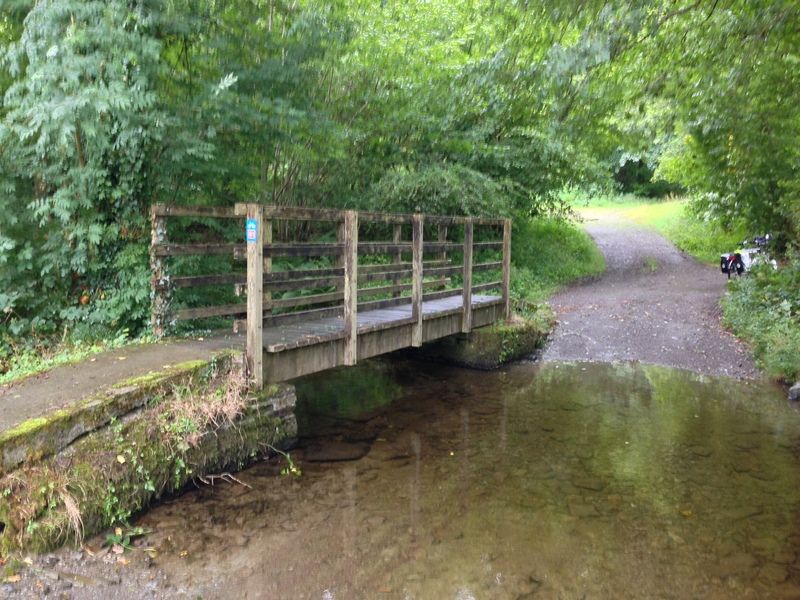 The route goes over a small wooden bridge into a wood, which is home to the trickiest off-road section. 79 miles Immediately after crossing the stream, the route follows an extremely narrow unpaved path, which climbs at a decent rate. The path can be muddy, somewhat overgrown with bramble, with no firm ground on either side of it. While it may be great for mountain biking, other cyclists may struggle, like I did, to stay on their bike as they negotiate this track. I am pleased that my struggle is uphill, as riding my packed touring bike down this path would have been asking for trouble. Anyway, it’s only a short interruption, as this path leads to the disused Great Western Railway track, a broad and straight path through the woods – unpaved though. 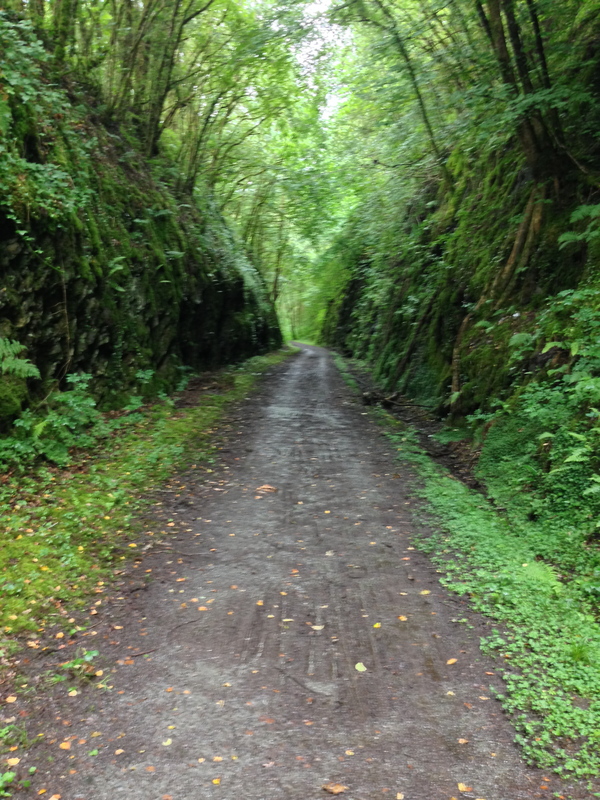 80 miles For the next few miles, the route alternates between the old railway track and quiet local roads. Occasionally there are gates to be negotiated, including one at the bottom of an off-road downhill. The last section of the route is very well signposted (it coincides with the EU-funded Ystwyth Trail here) and only intersects an A-road at Llanfarian. The final miles, between Llanfarian and Aberystwyth, take the route over beautifully paved car-free paths, to the end of the Ystwyth Valley, then briefly along the sea. When this privilege finally ends, Aberystwyth rail station is already in sight. I cycled from Welshpool to Aberystwyth between 17 and 19 August 2015 on a Koga Randonneur touring bike with two sets of panniers and a lightweight tent. 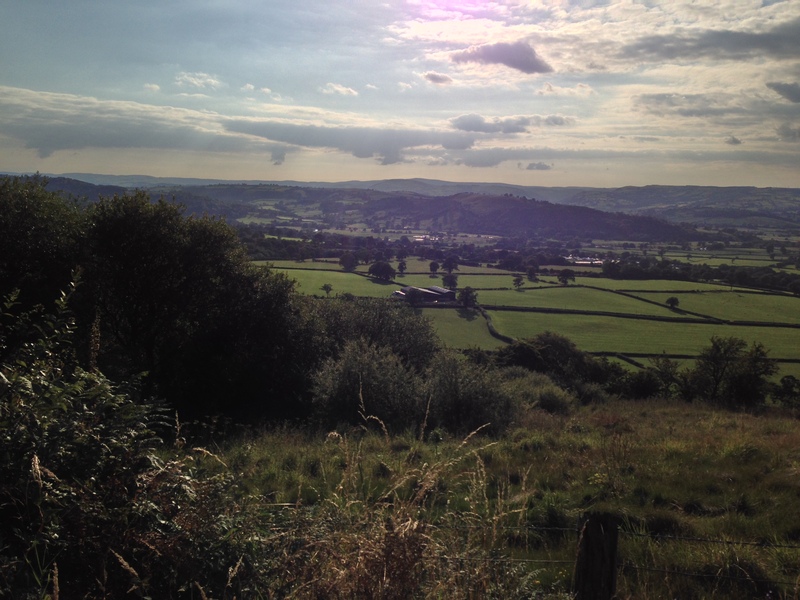 I camped in Caersws and in Cwmystwyth. Weather was sunny and warm on 17 and 18 August; heavy rain on 19 August. The total distance of this section of Route 81 is 90 miles (144km). The total elevation gain is approximately 6,500 feet (2,000 meters). The route uses unpaved roads and tracks on numerous occasions, sometimes for a considerable distance. While there are frequent opportunities for eating, drinking and camping between Welshpool and Rhayader, facilities along the route between Rhayader and Pont-rhyd-y-groes are scarce. 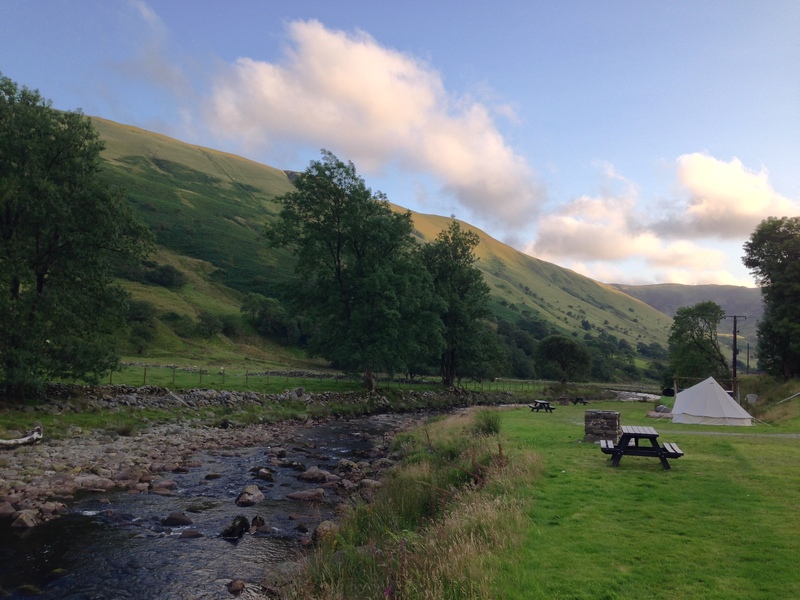 There is a campsite in Cwmystwyth but it has no shop or cafe. Come on Bournemouth! And Derby. Or Leicester. When in 2010 Hull City and Portsmouth were relegated from the FA Premier League it meant that two English regions lost their only team in the top flight. Since a similar fate had struck other regions in the previous years, the season 2010-11 became a contest between teams from four regions only: two from the North East, five from both the West Midlands and Greater London and a whopping eight from the North West. It must have been a cheap and easy season for some supporters – those of Wigan Athletic had seven away matches within cycling distance. 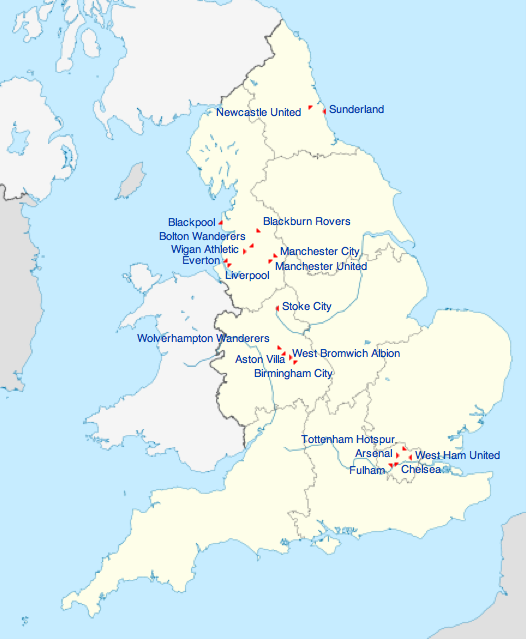 During its first decade, the Premier League (formed in 1992) consistently included clubs from seven or eight regions. The number fell to six in 2002, fluctuated between seven and five in subsequent seasons, until the 2010 dip that marked the first and only time in the league’s history that the majority of regions were unrepresented. Then, Norwich City and Swansea City came to the rescue and got themselves promoted from the Championship. This was remarkable, as the East of England had been deprived of Premier League football for four years, and no team from Wales had ever achieved the ultimate promotion. 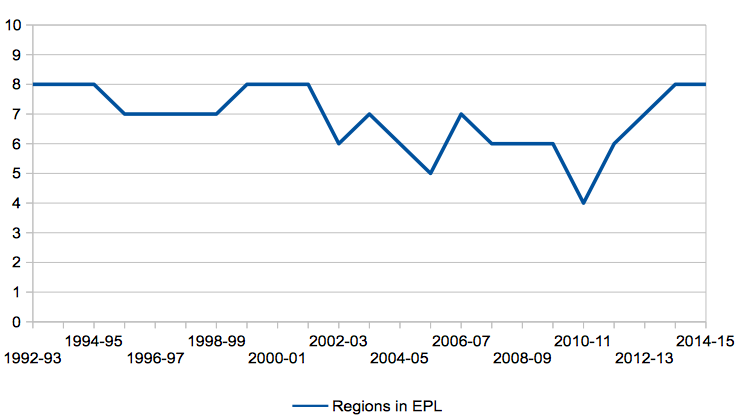 Sure enough, in the next few years clubs from other regions followed their example and currently the number of regions with Premier League football is back where it once started, at eight. Yet, that is still eight out of a possible ten – Wales plus the nine English regions. Interestingly and unexpectedly, a scenario for full regional representation is currently presenting itself. Here’s what it looks like. The two regions currently without a club competing in the Premier League are the East of England (Norwich City sadly went down last year) and the South West. The latter has been without a top level contender since 1994, when Swindon Town were relegated. Amazingly, with seven rounds to go, Bournemouth, the only team from the South West in the Championship, top the table, a position that would grant them their first ever promotion to the Premier League. With Norwich City, Watford, and Ipswich Town all in the top six, the East of England has three clubs well-placed for promotion. In a way, the promotion of sides from the South West and the East of England is the easy part of the scenario. The difficult bit is getting the East Midlands to cooperate. Their only Premier League team, Leicester City, are hopelessly glued to the bottom of the table and have nine matches left to close a seven-point gap to safe 17th. 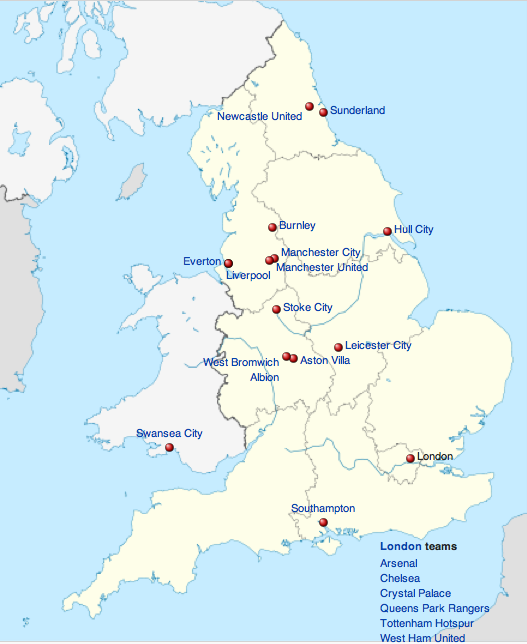 In the likely case of a Leicester City relegation, the Championship would need to provide a regional replacement to secure a ten-region Premier League season in 2015-16. Nottingham Forest have failed to keep promotion spots within reach, but Derby County are still hanging on, currently occupying 5th, which would qualify them for promotion play-offs. So there’s the scenario in full: Bournemouth and one of the Eastern clubs to take the two top spots in this season’s Championship, then either Leicester to stay up or Derby to win the play-offs. Oh, and we can’t have Hull City go down, that would spoil everything. If, like me, you would quite like to see an all-region Premier League for the first time in its history, now you know what to do. Cheer for Bournemouth, and for Derby (or Leicester), and for Norwich (or Ipswich or Watford, but not for all of them), and a little bit for Hull. Easy!